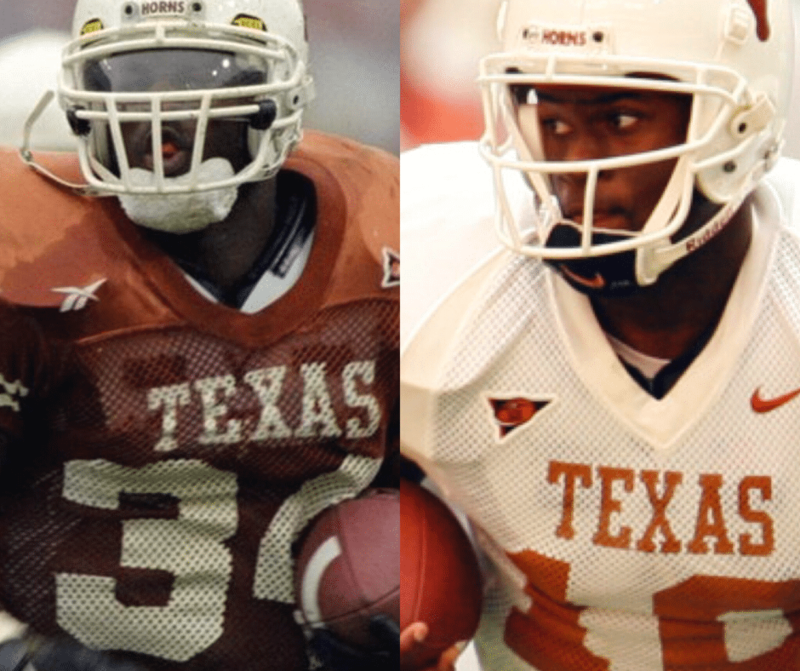 AUSTIN, Texas — Longhorns Legends Ricky Williams and Vince Young are returning to the Forty Acres Saturday, adding even more anticipation to game day as Texas sets to host USC. As Horns fans past and new celebrate Williams’ 20-year anniversary of winning the Heisman Trophy, the historic Horns running back is coming back for a very special Saturday. It is simply fitting that as Texas takes on the team it took down to become a National Champion, the beloved Young returns to campus as well. Both Young and Williams are signing autographs as the highlight of Saturday's Nissan Heisman House tour stop outside of Darrell K Royal-Texas Memorial Stadium before Texas looks to renew the rivalry with a win when they host the No. 22/21 USC Trojans at 7 pm. VY and Ricky will appear along with ESPN’s Ryen Russillo for a day-long fan experience. Williams will appear from 2:15-3:45 pm for a Chalk Talk session with Russillo with an autograph session with fans to follow. Young, who will be inducted into the Rose Bowl Hall of Fame later this year, will appear from 4-5:30 with a chalk talk and autograph session as well. Get down to the Forty Acres plenty early. For even more on the Forty Acres before the Horns host USC, Reckless Kelly along with Austin's own blues and funk duo, The Peterson Brothers, are set to play prior to the big game Saturday. Round Rock’s own Katie Glenn has been named Big 12 Conference’s Offensive Player of the Week (Sept. 11) for the second time in her career. Glenn led the still-undefeated Longhorns in scoring last week and that marks the third week in a row a Texas Soccer player nabbed top conference honors. In powering the Longhorns to another perfect weekend, with victories over Texas State (2-1) and Houston Baptist (4-0), Glenn tallied two goals and dished an assist for five total points over the weekend. The No. 18 Longhorns (6-0-1) Texas are home Friday, hosting UT-RGV at 6 at Fri., Sept. 14, at Mike A. Myers Stadium. The match is slated to be broadcast live on Longhorn Network, while the first 250 fans in attendance will receive a free 2018 Texas soccer team photo. Two-for-two for Texas junior Destiny Collins on the course this season. The Longhorns leading runner garnered Big 12 Runner of the Week honors after winning her second consecutive meet Friday at the Rice Invitational. Collins paced the Longhorns to a team win as well in running a 13:35.0, besting the second-place runner by more than 25 seconds. After winning the Texas Invitational to begin the season, Collins outraced the field despite a lightning delay prior to the first gun. UT now enters prep mode again as the Longhorns are back in action at the Wisconsin Invitational on Friday, Sept. 28. On the men’s side, though the Longhorns ran just six guys they still finished fourth as Jake Johnson took fifth in the meet, Brandon Gracia was 16th and Brendan Hebert was 20th. in the Preseason Oracle/Intercollegiate Tennis Association (ITA) Rankings recently released. Not to be outdone,Bianca Turati was tabbed No. 1 in the singles rankings and is one of four from the Texas Women’s Tennis Team in the singles Top 100. Junior Yuya Ito led the way at No. 29, while senior Harrison Scott (No. 47), junior Christian Sigsgaard (No. 54), senior Rodrigo Banzer (No. 61) and senior Leonardo Telles (No. 62) completed the group in singles. In doubles, the pairing of Scott and Sigsgaard checked in at No. 11. Turati spent nearly three months atop the ITA women’s single rankings last season and produced a 16-2 dual-match record for the Longhorns at the No. 1 singles position in 2018. She became the first UT player to top the ITA singles rankings since Kelly Pace in 1995. Junior Anna Turati is No. 21 in the singles rankings. The 2018 ITA Texas Region Player to Watch registered a 26-3 overall singles mark and completed her sophomore season ranked No. 33 in the final singles rankings. She posted a 16-1 dual-match record last year for the Longhorns, primarily at No. 2 singles. Junior Petra Granic is No. 40 in the single rankings, while sophomore Bojana Markovic is No. 95. Granic and Markovic are tabbed No. 21 in the preseason national doubles rankings as well. In addition, freshman Tijana Spasojevic earned No. 9 in the ITA’s national preseason list of newcomers. New Horns head coach Mike White will make his debut on the Forty Acres soon as the Texas Softball team announced its eight-game schedule for the upcoming 2018 fall season. Coming off a 14th straight NCAA Tournament appearance that saw the Longhorns participate in the Seattle Regional, seven of UT's eight fall games will be hosted at the friendly confines of Red & Charline McCombs Field. That begins with a game against McLennan Community College Oct. 12. One of the highlights of the fall campaign will occur on the road as the Burnt Orange & White travel to Conroe, Texas, to battle Southeastern Conference power LSU at the Scrapyard Dawgs (National Pro Fastpitch) facility on Sat., Oct. 20, at 6 p.m. CT. The remainder of the home slate includes doubleheaders against Galveston College and Blinn College (Oct. 24, 4:30 & 6:30) as well as Weatherford College and St. Edward's (Oct. 27, Noon & 2 pm) and a single contest against Texas State (Nov. 9, 6 pm). Texas will also play host to a special Longhorns softball "Alumni Game" at McCombs Field on Nov. 4 at 11 am. Ready for a return to Omaha next season, the Texas Baseball team earned No. 8 in the Baseball America 2018 recruiting class rankings. That slots in as tops in the Big 12. This marks the program's first Top-10 class since 2013 on the heels of the incoming class earning a No. 9 ranking by Perfect Game. Texas will open fall practice later this month, with more information on the annual Orange & White Fall World Series to come soon.